While it may seem obvious that food and water are the two most basic things that any responsible pet owner can provide for their animal, many of us fail to consider that the quality of the meals that we serve our pets is just as important as the quality of the meals we eat ourselves. Whether you usually opt for cheap and cheerful, or spend more believing that hire prices must equal higher quality produce, there is no right or wrong answer as to how much the best food for your pet should cost. However, there are some things that you can do, and traps you can avoid, to help you ensure that your animal is getting the best possible nutrition from their meals. 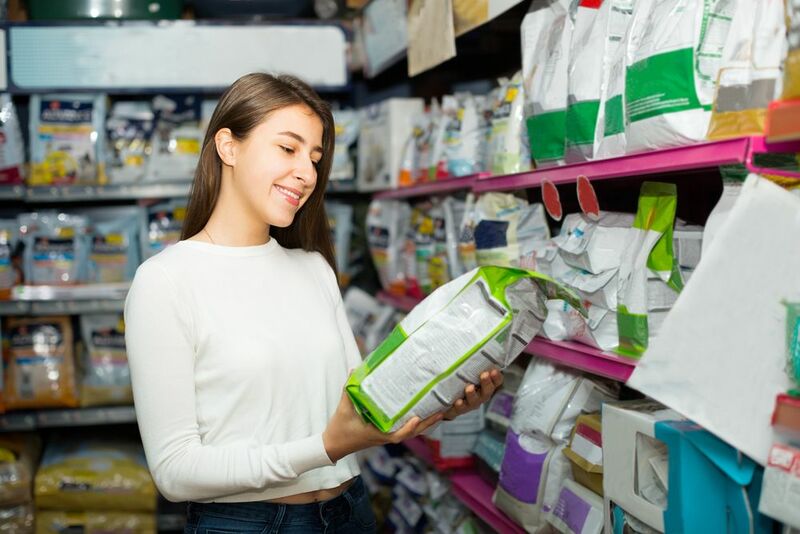 The pet food industry is extremely competitive, with dozens of brands and hundreds of different varieties of products to choose between. So, how do we differentiate between them? Much of our decision-making process is led by the way that brands decide to present themselves and market their products to us. Initially we may be attracted by brightly colored packaging and catchy slogans, which stand out, capturing our attention and piquing our interest. On closer inspection, brands may have used buzz words such as ‘organic’, ‘improved formula’ and ‘natural’ which make the product seem superior. Instead of being swayed by the marketing tricks of brands, the most important thing to pay attention to is the nutritional value of the product you are buying. The best way to ensure that the food you are buying your pet is of good nutritional value is to pay close attention to the ingredients label. When you consider the fact that for many of us, the pet food we give our pet is often the only food we provide, it is essential to check that it is nutritionally on point. Failing to provide the right combination of protein, fat and carbohydrates, as well as the vitamins and minerals needed, can seriously compromise your pet’s health. The majority of household pets are cats or dogs, both of which are carnivorous by nature. This means that the majority of their diet should be meat-based. In fact, they have virtually no need to consume carbohydrates, although some carbs such as grain are often added to pet food products as a cheap way of bulking them out, and keeping production costs down. If you have a high-quality pet food, a meat product should be the first named ingredient on the ingredients label, with a meat source product named second. This is usually the name of the meat, for example; chicken, with meal added at the end – e.g. ‘chicken meal’. Whole food sources such as lamb, beef, turkey or chicken should be specifically named and the greater the amount of meat at the start of the ingredients label, the better the food is for your canine or feline friend. As you work your way down the ingredients label, the third and fourth items listed should be vegetables and a wholegrain carbohydrate. Not all ingredients are naturally compatible with pets, and many are devoid of any nutritional benefit. One of the biggest things to avoid in pet food is anything soy-based. Soy is incredibly bad for an animal’s endocrine system, and is well known for causing allergic reactions in pets. Unspecified meat ingredients are also one to avoid. These are often created from the much less desirable and unhealthy parts of an animal, such as the hooves, cartilage and even feathers! Finally, you should also avoid products that have artificial colors, sweeteners, flavors and preservatives listed on the label. Many of these are considered to be carcinogenic, which has the potential to increase the likelihood of your pet developing cancer. Different species and even different breeds can have completely different nutritional requirements. Therefore it is always best to contact and consult our veterinarian before making any drastic changes to your pet’s diet.